Congratulations Hannah for Demonstrating Prize and crystallography PR! Third year PhD student Hannah Dalton was recently awarded the Barry-McCabe prize for demonstrating by the School of Chemistry. This prize was established by the School of Chemistry to mark the long standing contributions made to undergraduate teaching and postgraduate research by Mr. Brendan Barry and Dr. Tom McCabe. It is awarded annually to an outstanding postgraduate demonstrator of the JF Chemistry Module (CH1102) which spans aspects of organic and inorganic chemistry. 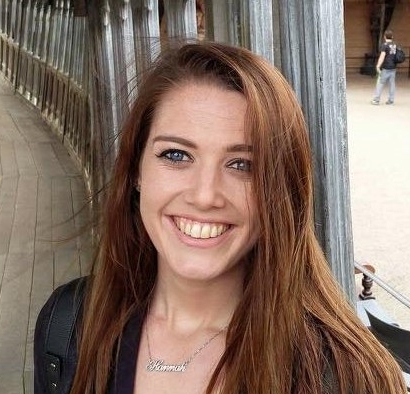 In April, Hannah received a bursary from the IUCr to attend the 16th BCA/CCG Intensive Teaching School in X-Ray structure analysis, a week-long course covering theoretial and practical aspects of X-Ray structural analysis that is run every other year. She was also featured in their monthly journal. Our paper “Two-Photon Luminescent Bone Imaging Using Europium Nanoagents“, published last year in Cell Press’ journal Chem, was highlighted by the journal as one of six papers from 2016 that was of particular scientific importance. Once again, congrats to Esther and Steve on their work. Esther’s work on cyclen-appended gold nanoparticles, which can be used to image microcracks in damaged bone, has been featured by the international news agency Reuters. The work which was published last year as a cover article in Chem, the new journal from Cell Press. Leigh and coworkers have created the first example of a molecular ‘octafoil knot’, a novel topology which crosses itself eight times. The work was published in Science last week. This fascinating and beautiful discovery was quickly noticed by NewScientist magazine, who published an article on this step forward in the world of molecular knots and links. Several scientists, including Thorri Gunnlaugsson, were interviewed as part of the article. Esther’s work on the front cover of Issue 3 of Chem. Chris and Amy helped to design the cover. Great news on the publication front as Drs Esther Surender and Steve Comby celebrate their paper titled “Two-Photon Luminescent Bone Imaging Using Europium Nanoagents” being recently published in Chem, a new and upcoming journal from Cell Press. Not only was their work featured on the front cover of the issue, it was also picked up by several of the national broadcasters for Ireland, being reported in RTE news, the Irish Independent, Irish Examiner and Silicon Republic. Congratulations to Esther and Steve on this great achievement! Thanks to all the authors of the article for their contribution. Huge congrats to Dr. Esther Surender on her Potential Energy article published in Chem titled “Exploring New Frontiers in Medical Diagnostics through Collaboration“. This short article discusses her PhD research project which led to the teams article “Two-Photon Luminescent Bone Imaging Using Europium Nanoagents“, as well the benefits of pursing a multidisciplinary PhD. Chris and Amy from the group recently appeared in The Irish Times national newspaper as part of a feature article on an imagery competition, held in Trinity Biomedical Sciences Institute (TBSI), to showcase the variety of research that is currently being carried out within the institute. This competition was part of the 5th anniversary celebrations of TBSI. The composite image made by Chris and Amy was based on soon to be published work on liquid crystal tricarboxamide derivatives developed by the pair, with one of the images used obtained in collaboration with the Pal Group in Durham University. Their contribution is now on show in the foyer of TBSI.